After my health deteriorating a little, I decided to do water fasting for real. There are many articles about the benefits of the water fasting (such as this awesome TED talk) and they also warn you that it is not for everyone. So I urge you to consult your doctor before proceeding with water fasting. Well, many doctors will advise against water fasting because of its drastic affect it will bring to your body and mind, such as rise of cholesterol levels, low (no) sugar level, getting nausea, etc. But I decided to forgo the warnings and determined to do this for my health. In fact, there are many clinics and retreat centers you can signup for that cost thousands of dollars. This would mean that I am taking very expensive “vacation”. Another way I saw water fasting was that, if for whatever reason I was ill and lay on the hospital bed with the IV on my arm feeding water, this would probably be the exactly equal to water fasting. So before I actually end up on hospital bed, it makes sense to try it out. Before I share my account of water fasting, I do want to start by some of the essential lessons I learned during my fasting period. We all deserve to live to 100 years of age. Let’s not bring bad habits in the way. Even though we as a society advanced so much in such a short period (within last 50 years), having so much abundant sugary food all around us for such cheap price, thanks to industrial revolution and science, one surprising fact that remained true for 10,000 years is that our body has been remained same since the days of hunter-and-gatherer age, constantly having to go through famine and starvation. In this time of age, due to industrialism and commercialism, we are getting hit with hundreds of advertisement of sugary, savory food that is telling us that “it is okay to eat so much.” No wonder more and more are becoming obese and causing all sorts of serious health issues. So what’s the problem with eating so much sugar? Well, our body basically operates with sugar. It is the main source of energy. In fact, sugar is the first that gets absorbed by body, converted into glucose, to then provide energy for the cells quickly. The problem is, we tend to take too much of it too quickly (thanks to all those TV ads and industrialism). When we do intake too much sugar too quickly, too much sugar will quickly end up in blood stream. This is not good, causing hyperglycemia, which further can result in all kinds of serious disease. So body will work harder to produce insulin to convert those extra sugar into fat and store them away. But if one prolongs this habit for too long, which in this day and age very easy to do, soon or later, body will become insulin resistant, leading to diabetes. So here is the wisdom I discovered: the key is to supply our body with steady stream of sugar over longer period of time so that there is right level of sugar in the blood stream spread throughout the hours. This is where food pyramid comes in. For simplicity, I will divide food into four categories: pure sugary treats (ice cream, candies, caramels), carbohydrates (noodles, rice, breads, snacks), protein (meat) and fat. Pure Sugary Treats: Contains least calorie per gram but gets converted into energy and made available to body right away. This is the far easiest for body to convert. As soon as you intake those pure sugary treats, the body will digest and make them available to blood. Problem? There are so much of it all around us! Noodles, Rice, Snacks, Breads (Carbohydrates): Then there are carbs such as noodles and rice we eat. Body has to work little bit harder to break them down into glucose, but job is ever easier since usually these food are “refined”. Body has to do little work to break them down and get them converted. Still better than the sugar itself, but we tend to take lots of portion! Basically, if you eat a bowl of spaghetti or ramen, think of them as a bowl of sugar. You can certainly slow down digestion of carbs by taking whole grain which also has good amount of fiber. Lean Meat (Protein): Protein is generally used to repair tissues but when body runs out of glucose, it can be the source of energy as well. If taken too much, again, we are stressing our body to work harder to remove excessive protein in our body which can lead to kidney stone (source). So what is the problem with eating that stake or pork chop, or even rotisserie chicken? Usually, these meat comes with loaded with trans and saturated fat. And we tend to eat a lot of it, which means, we are taking in a lot of very very unhealthy fat. Fat: Fat, at one time, has been vital to our body’s survival. I will cover below how efficient fat is in making energy from. It has the biggest calorie per gram. No wonder our body converts excessive glucose into fat so that we can in turn use them as energy when our ancestors had to go through famine. The problem with fat is that, we tend to eat it with sugar and carbs. So all of those fat does not even see a light of the day to get converted into energy source but stored right away into our “body fat” as an energy reserve. It is only gets used when we run out completely of sugar in body. The problem? We tend to never run out of sugar and carbs! Those fat we intake will make us literally fat! So what is the solution to maintaining health in the world of wild wild plentiful? One very known solution is to do at least 30 minutes of vigorous exercise so that we give our “fat” a chance to convert them into energy source and burn them off. But let’s be honest. We are little too lazy to even spend 30 minutes for our body. Is there any other way to get to the road to prolonged healthy life? Yes! We need to change our eating habit and stick to this wonderful chart that shows the proportion of food that we need to be taking on a daily, weekly, and occasionally based. Ladies and gentlemen, I introduce you to the Healing Foods Pyramid! 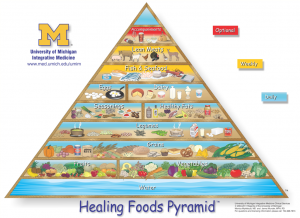 University of Michigan Medical School put out Healing Food Pyramid which I love. It simply and plainly shows the types of food and its corresponding portions we should intake. As you see, vegetables are at the bottom indicating that you can get large portion of it. Why is vegetable so good for your body? It digests the slowest and releasing essential nutrients over longest period of time, just enough for the body to use as energy. Unlike sugar or refined carbs, body also has to work harder to break down vegetables to get energy out of it. Because of this, it take much longer to process and convert them into energy source. As a great side effect, vegetables supply body steady energy over longer period of time, not needing to worry about creating insulin to then convert excessive sugar into fat. So do take advantage of this great characteristics of vegetables, eat excessively, satiate your belly, without having to worry about energy this, fat that. Though, you should avoid high carb vegetables such as potato, corn, yam but stick to low carb vegetables such as broccoli, lettuce, celery. If you really have to take breads and sorts, try sticking to whole grain so that it too allows release of sugar over little bit longer period of time. When taking in meat, try sticking to lean meat and stay away from any animal fat as they will literally become your own fat. 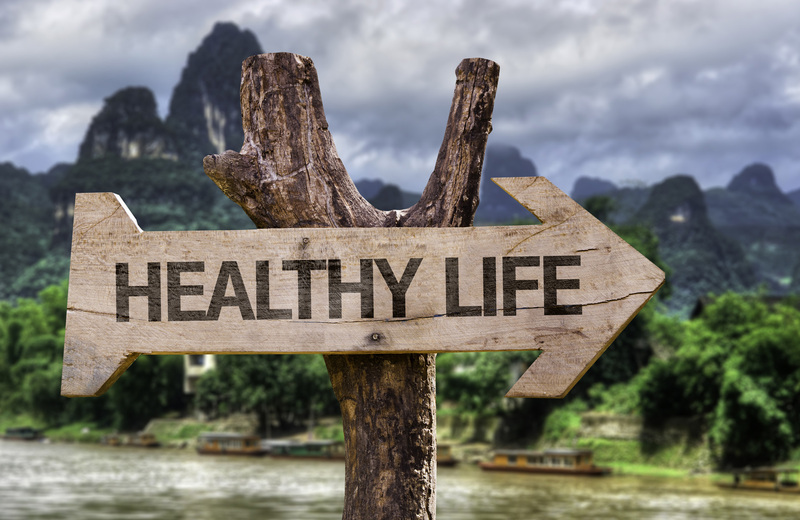 Of course, as always, getting into habits of balanced diet along with rigorous exercise once per day is really the key to healthier and happier life. One of the key benefits of fasting is detoxification of your body by letting your body take time off from digestion which is constantly at work around the clock, 24×7. By relieving its duty from digestion, cells can actually go and do other vital functions such as repairing and recovering our body. While fasting, cholesterol level goes up, but this seems to be very normal since it is used to convert fat into energy. Also, studies have shown that it is not the high cholesterol that causes blood clot, but what happens is that, cholesterol’s vital function is patch damaged areas of the blood vessel so that the damaged areas have a chance to get healed. Once healed, cholesterol automatically gets detached and continue to circulate the blood stream and look for more damaged tissue to then repair. The problem is that we don’t give our body enough rest and the damaged tissue with patches of cholesterol does not get healed and the patch remains tightly over longer period causing eventual blood clot. Because we stop taking food that has so many toxins (food colorings, pesticides, etc), that good portion of immune cells that usually line up against stomach and intestines to then get rid of these toxins are now freed up to look for other intruders in the body to fight off and help body recover from damages. Lastly, since body usually stores toxins in our fat, as body start to get into ketosis, and convert fat into energy, toxins from the fat is released, making it an effective way to get rid of the toxins (source). There are so many benefits that the fasting brings, including treating serious medical as well as mental conditions. All the more so, it allowed me to forge ahead with water fasting. So, here is my account of 14 and 1/2 days of water fasting. I had a lot of food craving throughout the day, especially into evening. But I tried to relax and kept drinking water in small amount frequently. I decided to just lie down and enjoy TV show on the sofa and play with my puppy. Throughout the night, I felt that sugar was sipping out of my body. At times, I felt bit dizzy. I was trying to just forget about everything and enjoy the sleep. I felt that I didn’t want to get up. But I did. After all, I had 10 hours of sleep. After a hot shower, I felt refreshed. My stomach still felt bloated. I weighed myself and it seems I lost about 5 lbs. Whenever I felt craving, I drank one good gulp of water. I continued to drink water throughout the day in moderate amount. Too much water made me use restroom frequently which I knew made my kidney to work harder. I’m noticing that I’m going to the restroom more than usual. It looks like it took about three full days for all sugar (glucose) in the body to get depleted. I always carried a water bottle and took a good gulp whenever there was craving. At work, I started to have good amount of headache, probably due to body asking for sugar! Also, my job required a good deal of brain use. The headache was similar to the ones you get from hangover. I came home early, relaxed myself on the sofa, watched random shows. My family preparing for dinner made me crave ever more. In fact, that night, I dreamt of eating lots of crispy kettle potato chips. After a good long sleep, headache was gone but I still felt little dizzy. I lost another 4 lbs. When I was blow drying my hair, my arm couldn’t hold the hair dryer for the entire time. It felt like my body used up all of the sugar and felt weak. When I stood up for a long period (1 hour), I felt some back pain. Some articles indicated that this is due to kidney and liver releasing toxins and the pain comes from toxins affecting spine nerves. My mouth started to smell really badly. Some say that this is due to toxins getting released. I continued to gulp the water. I almost wished that I could take quick 10 minute naps since my body didn’t seem to have much energy. My bloated belly didn’t feel too bulging out but I could still feel bloatedness. Because my body felt so weak, in day three, my mind was trying to come up with all of the excuses to stop the fasting. I ignored them all and slept early and gave my body at least 10 hours of rest. What a different day. I had no headaches and I felt for the first time in three days that I actually had energy restored in my body. Though, muscle still felt weak when I tried to push it by lifting heavy objects. Surprisingly, my stomach stopped craving. Even though I smell food or see people eat, I didn’t get cravings but able to simply move on. I tried to do small work out like push-ups and sit-ups and some squats. This turned out to be a bad call. It made my heart work harder, which was not good especially when I’m into fourth day where body now knew that it is in the state of emergency and metabolism probably slowed down, which included slowing down of heart to conserve energy. For the first time, I felt that my body was not generating as much heat as I used to. My hands never really gotten cold but I actually started to feel much colder. I ended up putting sweater over (it was March in NYC) to keep myself warm. I still felt bloatedness from my stomach and my mouth still had bad smell but not as much as day two. One common thing that those people that went through fasting told was that you become very conscious of food and health. I can see that because although I didn’t feel craving any longer, I was watching a lot of food channels and begin to think about food and researching into how food affects the body. I begun to think about delicious vegetables like bean sprouts as well as started to collect recipes. My urine’s color was mostly transparent with a hint of yellow. It felt like my body is detoxifying. Instead of watching other shows, I begun to watch more food oriented shows. Though, as I watched these food shows, I could feel that brain was thinking about food but knowing that it couldn’t do much to change my mind, somehow it was little bit confused and gave me a light headache. Because of the headache, I decided to stop watching food shows. Everything seemed usual, meaning, I was able to perform almost everything perfectly normally, such as going to work, attending round the clock meetings, but with little bit of less energy. My stomach still felt bloated but I can see that it is going down little bit. I lost anther 3-4 lbs. My head did feel light and whenever I tried to get up quickly, I felt dizziness. I found out that this is due to brain not getting enough blood and the part of brain that controls balance had little bit of delay in adjusting the body. This was a weekend for me. Everything felt all usual. I slept good amount. I went to the doctor and all came out positive. My heart seemed to be stabilizing. I continued to lose about 2 lbs. I’m noticing that I started to lose less pounds per day and amazed at how efficient and resilient my body was (no food for 7 days!). I sat down with my family for lunch, went to shopping, hung out at Starbucks for a couple of hours with my daughter and worked on my mobile game. I definitely knew that even though it was now converting fat into energy (ketosis), and my muscles are getting their energy supply, if I stood up for more than an hour, I did feel the back pain etc. I consistently had to take some rest where I can lean my back. My headache went away and I was able to function normally for the most part. My mouth still had bad breath. It smelled like a bad beer. My urine still had light yellow color and smelled like vitamins that I took every day before I begun water fasting. I continued to watch lots of food shows (I can’t help it). I printed out Healing Food Pyramid, as well as photos of “cancer causing food” and “superfood” to educate myself and my family. According to this awesome Healing Food Pyramid, our meal portion should be 3/4 veggies, and 1/4 carb and that 1/4 carb can be replaced with meat/fish once per week. I started to look into cooking delicious veggie oriented asian dishes and found that there were a whole world of cooking out there that I could make a hobby out of. I started to jog down recipes and sauce names. My body continued to feel all normal. I still did not have any craving. I got brave yesterday night, and made a quick veggie dish for my family. It didn’t come out as I expected but it tasted okay. I had a mild headache in the morning probably from the cooking and possibly brain confused again for smelling delicious food but still not seeing anything coming through the stomach. My belly still felt little bit bloated. I continued to lose about 2 lbs. I had enough sleep. For some reason though, I couldn’t sleep too well. It seemed that my body, especially heart, was little bit anxious. Instead of cooking, I decided to rest since I had a mild headache. I have very oily hair and skin but throughout fasting I noticed that my hair as well as my face was pretty oil free. Also, one great thing about fasting was that my sexual drive had gone down tremendously which was a great feeling to have. For the first time, to my huge surprise, I only lost 0.2 lbs. I’m really lost as to why so little weight loss. The only explanation that I have is that because it is now really using fat for energy source, and that fat has the most calorie per gram, body became so efficient in burning the fat and supplying just enough calories (1,600 calories per day) which may equal to about 0.2-0.5 lbs. My greediness kicked in and I begun to do some light exercise in the morning such as push-ups, sit-ups and squats in the hopes of speeding up the burning. Though, because my body only is making just enough energy to sustain the body, I was not able to do too many until I got exhausted and had to rest until I regained strength back. I received the blood test results, which was took on my day six of fasting. Surprisingly all of my cholesterol levels shot up to dangerous level. LDL was super high and HDL was super low but triglyceride level was normal. After some intense research, I concluded that this is because my body is releasing cholesterol to burn fat and stabilize my body functions. Today, for the first time, I felt that I came back to normal condition where I didn’t feel any headache, nor weakness and my sexual drive seemed to come back little bit. In fact, in the evening, I took a 30 min brisk walk on the treadmill and did some push-ups and sit-ups. It seemed that due to the exercise, I lost about 0.5 lbs. I continue to be amazed how efficient the body is. Okay. I made a big mistake yesterday. Somehow I felt that since I was not losing weight fast enough, I tried to use up more energy by exercising. But this backfired. Doing exercise in the morning clearly exhausted my energy reserve that my body worked hard to convert the fat into. In the afternoon, I started to have a mild headache as well as became sleepy and cranky. (Well, I was attending a 2-day conference that required a lot of my brain power) So the new plan was to save energy in the morning and in the afternoon for brain but at night, if I felt that I had leftover energy, I would deplete it by doing a brisk walk or push-ups. Fortunately, I had great sleep and rejuvenated my body. I felt like I was given another chance. I lost about 0.4 lbs and continue to be amazed at how much energy fat has. From day twelve to fourteen, I continued to function normally. Going into weekends, I had done the Peanut Leap Trail (light version) at the Palisades Parkway in New Jersey with the family on snow. I had to stop frequently to slow down my heart. After taking many 1-2 minute rests, I was able to continue and finish the hiking. My body still felt weak and colder than usual and needed to bundle up to keep myself warm. I was able to do some push-ups and sit-ups, continued to resist the food craving, and my mouth continued to dry up. I took a gulp of water whenever I felt dryness in my mouth. My mouth didn’t seem too smelly but still dried up a good amount of time. For day twelve and thirteen, I almost did not lose any weight. In fact, I may have gained some weight. I don’t think this is possible but I can see how body is trying to conserve energy and that little water that I drank may have shifted the weight. I took the whole week off from work and day fifteen was the first day into my vacation. Since I felt so good, I decided to find the new hiking trail and decided to go. I researched and bravely went to Storm King State Park trail all when there was still a foot of snow on the ground. Turned out that this was very demanding hiking especially with snow. At one point, I lost the marker and had to rely on my GPS. I ended up going through really steep ascend which made my body to work even harder. After successfully completing the trail, my body really was exhausted. After coming back from the hiking, I tried to relax by body by getting some sleep but somehow I was not able to. My body was extra colder and because of this, I could not fully rest. This must be because of the all of the stress I put myself through the hiking. And it happened. As I was trying to get myself up from the sofa to turn the TV off, I felt extra long dizziness, which made me to black out for literally like 5 seconds. By the time that I became conscious, I was sitting down on the floor, my hands tried to grab things around me to slow down my fall. I actually never fainted in my entire life and so it really felt weird. My faint actually made my family as well as myself worried so much that 14 days were enough and decided to end the water fasting. There are tons of articles on how to break the water fasting properly. But for me, I knew that I had to stick to veggie diet to satiate myself and continue to maintain my healthy weight. This way, I can possibly continue to lose weight by not supplying my body enough sugar and carbs too much and in turn, continue to burn fat. I took out a few dishes that my wife made: bean sprout dish and tofu dish. As I was eating them, having not eaten for 14 days, it really felt weird to take food in and chew. I almost forgot what it was like eating again. Next day, I continued with my vegetable diet. This time, I indulged myself into a good sized portion of vegetable food, but turned out that this was way too much for my fasted stomach to handle. I learned to control my portions even though my food was all vegetables. After a few days, I regained 5 lbs back. I’m hoping to continue to maintain that healthy weight. Though I decided not to stress too much since I know that I am now ever more prepared to do wholesome balanced diet (finally). I do know that I lost good amount of belly fat (about 2 inch off of my waist) totaling about 20 lbs weight loss, detoxified my body, and became very health conscious, including changing my eating habit to strictly low-carb and mostly vegetable oriented diet. I plan to continue to do intermittent fasting so that I can get rid of toxins periodically as well as give my body a well deserved chance to rest and heal. What was your doctors response to fasting for 15 days ? Hi Tracey! Yes, my doctor was very surprised to find out and asked me if I was alright and advised against such extreme approach. But I wouldn’t second guess that would be any doctor’s response. My blood work checked out and I still had slightly high cholesterol which I came to believe and blame my gene :). Hi Philip — I enjoyed reading your experience with fasting. But I think you have some science wrong. Fat doesn’t convert into fat. Look up ‘lipogenesis’. When we eat sugar or starchy carbs our body produces insulin. Insulin’s job is to take excess sugar, convert it to fat and store it away for future use. The problem is we can only use the fat we have in storage if our insulin stops converting new sugar into fat and storing it. In other words SUGAR is what makes us fat. Lipogenesis. Eating fat is only a problem when you eat it with sugar. Eating fat on its own or with protein or high fiber veggies has not been proven to cause problems. In fact, fatty acids are another fuel the body can use plus fat is so satiating it can help stop a desire for sugar. I recommend looking up the words ‘ketosis’ and ‘ketones’ as well.